Speak with a Psychotherapist Online via Skype for effective online therapy for Depression and Anxiety, Panic Attacks, Social Anxiety and Agoraphobia, Addictions, and other emotional problems, including PTSD. Email me to find out more about this online counseling service and organize a online Skype counseling session with me. Now, in the last few years or so more and more people have been seeking Mindfulness Therapy for their Panic Attacks and General Anxiety over the internet using Skype, as I say, which works extremely well, and there are many studies that show it to be equally effective to in-person therapy. And in some ways, it is even better than in-person therapy, because the client feels more empowered and in charge of the process. Any how, I just wanted to take a couple of minutes to describe to you a little bit about what Mindfulness Therapy is and some of the essential principles of how to work with your anxiety, and particularly with your panic attacks. Panic attack anxiety is very, very painful. It is one of the most painful forms of emotions that a person can experience. I know this from personal experience as well as from working with people. It is very distressing. Out natural reaction to distressing emotions like this is, of course, to run away from them, or to avoid them, or to indulge in a whole range of secondary reactivity – Thinking about the fear, worrying about how you are going to cope if the panic attack should occur, what people are going to think about you, and so on – And this starts to spin out of control and people suffering panic attacks can literally just close down entirely. When we work with panic anxiety here in the office or online through Skype sessions, the first and most essential principle of Mindfulness Therapy is learning how to sit with that emotion, with that feeling. The term, “sitting” is a very nice term and it describes the process very well. It’s like sitting with a friend or a child who is in pain, in which you are basically there, being very present with an open mind and an open heart. The attitude of friendliness is absolutely essential. So, when you are encountering panic anxiety, what really helps is if you can take a few minutes and start to explore how to sit with that feeling as you experience it in your body and in your mind as if it was a child in pain, crying for your attention. And in many ways, that is the function of mental pain or suffering. It is there to attract our attention. It’s saying, “Look over here!” and the skillful response to anxiety of all kinds is to do just that. It is to take the time to look at the anxiety and sit with it without becoming reactive, without getting caught up in the story, the emotional drama, in all the secondary thinking about the pain that you are experiencing. It is just to create a space inside in which you are sitting with that pain and being fully present. When you do this, you are creating the right internal conditions that allow that anxiety to begin to change itself. One of the second principles of Mindfulness Therapy is that we understand that our mind is more than capable of solving the problem of emotional anxiety. Our psyche has the skills, the intelligence, and all that it needs to heal emotional suffering, in the same way that our body has the skills and bodily intelligence it needs to heal a physical wound – a cut or a graze. However, in order for the psyche, that is the Big Mind, the intuitive mind, not the thinking mind, but the deeper intuitive aspect of our mind. In order for it to begin to start healing anxiety it has to have freedom; freedom in which to change. This freedom, which allows an emotion to begin its own transformation and healing is exactly what we are providing through mindfulness. 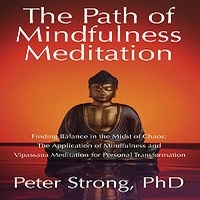 Mindfulness, as I define it in my book, ‘The Path of Mindfulness Meditation’ is engaged-presence, is that quality of being really, really interested and present for your experience, without getting caught up in reactivity and thinking about the experience, which is not the same as being present. So freedom to change equals presence equals mindfulness. It’s hard, it’s a hard process, to literally learn how to face your emotions and your suffering in this way. It is hard, but it is possible. It is a process that is guaranteed to lead to beneficial change. So, I invite you to experiment with this by yourself. Learning bit by bit how to sit with your pain and create the right inner conditions that will allow that pain to undergo transformation and healing. If you would like more information or if you would like to talk to me about your panic anxiety, or other forms of anxiety, please send me an email. Visit my website to learn more. Mindfulness-based Online Therapy for Panic Attacks Anxiety is now available online via Skype. As a professional psychotherapist I’m often asked how to stop anxiety attacks, how to stop yourself from becoming overwhelmed by anxiety and anxiety producing thoughts. In my experience the most important approach that will help you stop anxiety attacks is to learn how to embrace your thoughts with mindfulness. That means, essentially, developing a conscious and friendly relationship with your anxiety producing thoughts. So you must not fight them or avoid them. That will simply make them stronger. But once you start developing a friendly relationship to your thoughts, that will take that power away and it will also stop feeding those anxiety thoughts. If you hold these thoughts in consciousness without reacting to it, long enough, that thought will always burn itself out. So we need to build mindfulness towards his thoughts. You are essentially teaching those thoughts to being themselves calm. So that’s part of causing mindfulness therapy approach that I teach and there are many other aspects to mindfulness therapy that can be used to stop anxiety attacks and panic attacks, but that’s the principle, the central most important thing. Another very common technique that I teach that really helps in this process of breaking free from the power of anxiety thoughts is to use visualization or imagery. We call this mindfulness based imagery reprocessing. So this is where you take the image of the thought and you make it extremely small, perhaps as small as a grain of sand. And then you take that grain of sand and you place it on the ground. If you make it small and you put it at a low level such as on the ground you will take away a great deal of its intensity because the key factor that causes thoughts to have emotional intensity is there size and their position, the imagery of the thought, itself. So when we look at our thoughts with mindfulness, that brings in an element of choice where we can begin exploring ways of changing the size and the position of our thoughts. And the smaller they become the less intense they become, and if you put them at a lower level that will take away their intensity, as well. So that’s a simple technique using mindfulness based imagery reprocess that you can try for yourself. If you find success with this method, please leave comments below. Do please contact me if you’d like to schedule Skype therapy sessions with me to learn more about how to stop anxiety attacks. Thank you. Conventional counseling can be useful, but what most people find is that just talking about your feelings does not change the underlying structure that is the real cause of your emotional suffering. This also applies to the use of prescription meds. – prescription medications may provide a temporary relief from anxiety and depression symptoms for a while, but medications will not change the underlying cause that produces your emotional suffering. The style of psychotherapy that I prefer is called Mindfulness Meditation Therapy, which can be remarkably effective for healing anxiety disorders, including Generalized Anxiety Disorder, Social Anxiety Disorder, Agoraphobia, Obsessive-Compulsive Disorder, Phobias and Panic Disorder} as well as for treating non-clinical depression or other psychological difficulties caused by habitual reactive thinking. Most of my clients experience very real reduction in the level of their anxiety and depression after 3-4 sessions of Skype Therapy with me. This Skype counseling service is available throughout the USA, UK and Western Europe and world-wide. All you need is a good internet connection and you are ready to start Skype counseling. It is critical that you simply learn how to, essentially, meditate on your anxiety and depression. You’ve got to from a friendly relationship with your emotions. The majority of us, needless to say, react negatively to our anxiety, depression or other negative emotions with avoidance or some kind of resistance to those disagreeable emotions. We do not want these unpleasant feelings and we strive to get rid of them. This is surprisingly the worst thing you can potentially do, because this kind of reactivity makes the anxiety or depression develop and become more powerful. Any type of reactivity reinforces strengthening the anxiety or depression. What I’ve found, and numerous others in the area of Mindfulness Therapy have discovered, is that what actually creates change and transformation is when we train ourselves to hold the emotion in our conscious awareness without reacting to the emotions with avoidance and aversion. When you are doing that you’re learning just how to effectively be with that emotion without becoming reactive and without becoming overwhelmed by it. This teaches the mind an entirely different way of processing that the anxiety, and this allows the emotion to change, to resolve and to transform itself. Thus, if you’re interested in online therapy, do please email me and see my website and then we can explore further whether this form of mindfulness-based therapy is good for you. Please, visit my website and email me.